On the face of it, this is good news for ordinary Ethiopians. But dig a little deeper and tales abound of students required to join one of the three government parties, with reports of restricted curricula, classroom spies and crackdowns on student protests commonplace at universities. And now, … EPRDF blames the OPDO for the unrest, the massive acts of killing, the mass detention (now in the thousands). And the propaganda machine, elite politicos, elite TPLF apologists, and the Ethio elite in general (even those whom I considered sensible thus far) blame the Oromo people for resisting the master plan; they are presented as being ignorant, uninformed mass that is tossed around by OLF. And all Oromo parties–OPDO, ONC/OFDM, ODF, are OLF now. (And of course OLF is the ultimate enemy, the embodiment of evil itself, right? Oh yes, they are supported by Eritrea and other ‘historic enemies’ of Ethiopia, too.) Never mind some regret that OLF has such a compelling ‘presence’ in Oromia and even on OPDO. (I thought OLF is legally a terrorist organization. But it must be a powerfully resilient ghost, then! And the ghost is visible to TPLF and other ultra racist ethio-elite. Could this be the foretaste of the nightmare to come? Have they started to be haunted? Or is it that what we should do whenever the public resistance is against our own personal and group interest, we have to find an OLF ghost to blame.) … Which reminds me that, according to EPRDF’s book, the party/the government never errs. (Never mind their ‘criticism-self-criticism’ rhetoric of the 70s and 80s.) Popular resistance comes from the misinformed public. It is always the people’s mistake to resist bad policies. If people resist, here is what you do: co-opt some cadres and force them to implement it. If that doesn’t work, force the public into a meeting and tell it to them. If that doesn’t work, imprison/kill those who express disagreement. If not, raid a city, a locality, kill as much and imprison in thousands (tens of thousands!) to create a mass terror. Then, do a media report saying ‘some terrorist/extremist/ narrow nationalist/ and what not’ elements agitated the mass into resistance. Then gather people and demand that they express remorse about the resistance and that they give absolute support to the planned policy. … The cycle goes on. … Was I surprised? Ehmm, not really. That has always been the case.The people reject them by votes (as in 2005), they respond: oh, the people were mistaken! (Duh, in a democracy [I am assuming too much, I know! ]; people’s error is preferred to leaders’!) The Muslims resist the imported religious education, oh the Muslim public is mistaken. People resist dispossession, oh, they are mistaken because they heard some extremist facebookers in the diaspora. Despite these risks, there has been a steady flow of photos and videos on social mediashowing protest footage, as well as injured protesters, broken-down dormitory room doors, and even graphic images of people who have been killed. Some individuals in the diaspora and diaspora websites have been compiling this information, and the new#OromoProtests website has emerged as both an information portal and a mobilizing tool for diasporans and allies. France: Take the necessary measures in order for the law on media and access to information to comply with the International Covenant on Civil and Political Rights andprovide the proper framework for appeals within the 2009 anti-terrorist law in order to guarantee the respect for fundamental rights. 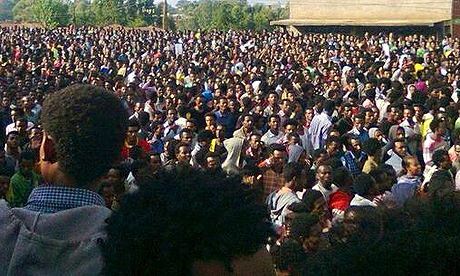 If you live in the United States or another country that provides aid to the Government of Ethiopia, write to your elected representatives to inform them about what’s going on, call on your government to condemn the Ethiopian Government’s response to the student protests, and urge them to withhold funds. The #OromoProtests website has somesample letters, and the Advocacychapter of Paving Pathways has more guidance for effective outreach. If Ethiopia rejected your government’s UPR recommendations, be sure to highlight that fact in your advocacy. This post is the fourth in a four-part series about human rights in Ethiopia. Part 1describes the important role the Oromo diaspora is playing in remotely monitoring recent human rights developments in Ethiopia. Part 2 highlights the May 6 Universal Periodic Review of Ethiopia at the United Nations. Part 3 explores the Oromo diaspora’s strategies for showing solidarity with the Oromo students while pushing for human rights and holding perpetrators accountable for the violence against peaceful demonstrators.